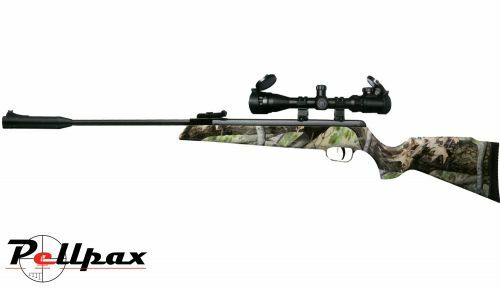 The Explorer from Milbro is a break barrel spring powered air rifle with fires .22 airgun pellets at full power energy levels for excellent performance in both target shooting and hunting purposes. The hard wearing polymer stocks are available in both black synthetic and camo synthetic to suit a range of purposes, and checkering is incorporated onto forend and pistol grip to ensure that a strong grip is achieved at all times. The action is made from metal and is finished in a deep blueing which oozes quality. Within the action is a standard spring and piston mechanism which fires pellets just below the legal limit to provide an effective range of up to 50 meters. The rifled steel barrel provides great accuracy, and the end of the barrel has an integrated sound moderator to reduce the muzzle report. Open sights are included as standard, and 9-11mm rails are milled into the breech to permit the fitting of additional optics such as rifle scopes and red dot sights. Scope and Mounts not included.